I have two boys who just love a bath. Having worked with children, water play features highly on developing important skills in your youngsters- more thumbs up for bath time! Most people are not willing to let their little darlings tip water all over the place like a nursery setting allows, so letting your kids learn, play and enjoy their bath is great for you and them! Clean, happy children! Now my tip for making bath time better is bath toys. Now I am not talking about expensive, shop bought toys. I am talking plastic household items. Old plastic bowls, plates, cups and plastic spoons are by far and away my kids favourite bath time additions. 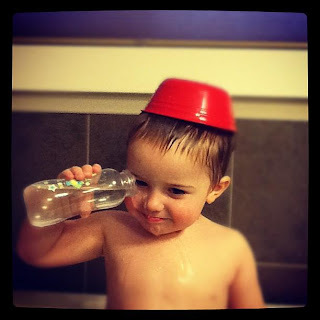 Kids have a fascination with filling and tipping and this is key to learning through water play. So why not make bath time more of a feature in your day? Extra tips include, plenty of towels next to the bath- kids tend to make water exit the bath via the sides and if the plastic toys leave scuff marks on your bath simply put a little toothpaste on and use an old toothbrush and scrub away the mark.